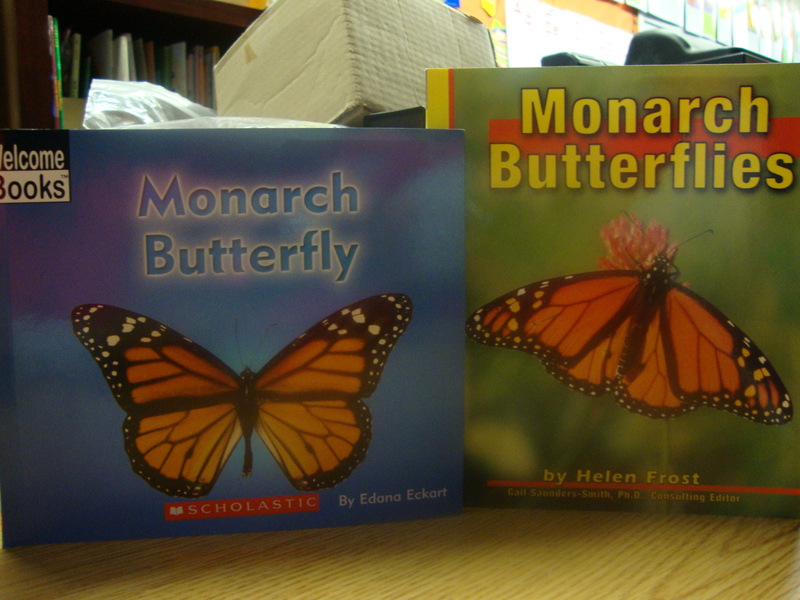 I do a big study about Monarch Butterflies with my kiddos each year. 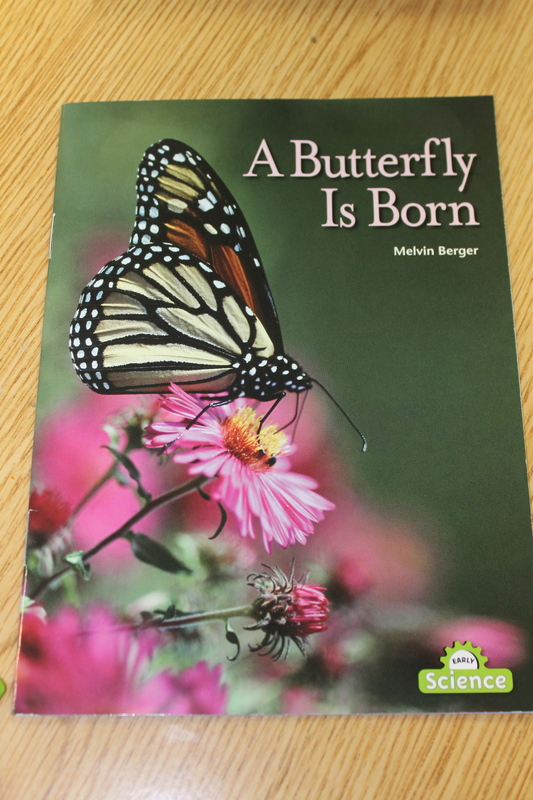 I want them to get caught up in the mystery of the Monarch and learn how they can be citizen scientists and help other scientists around the US in protecting the Monarch Butterfly. 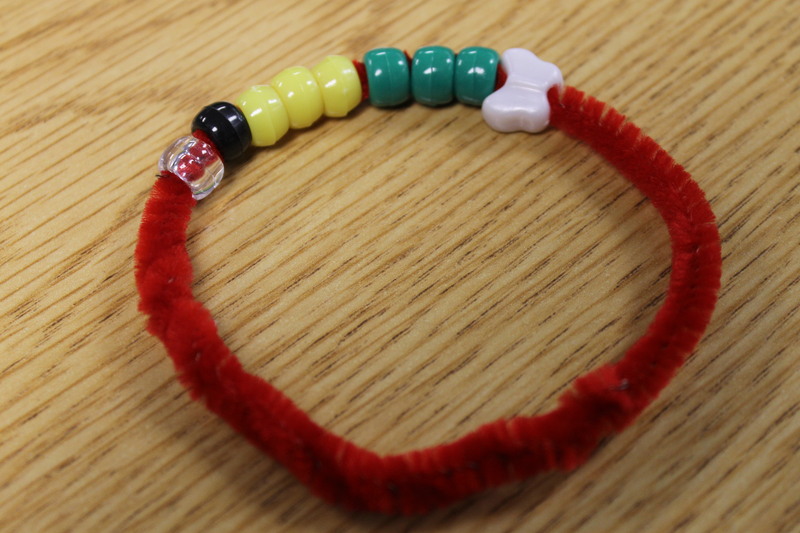 One of the activities we complete are Monarch life cycle bracelets. 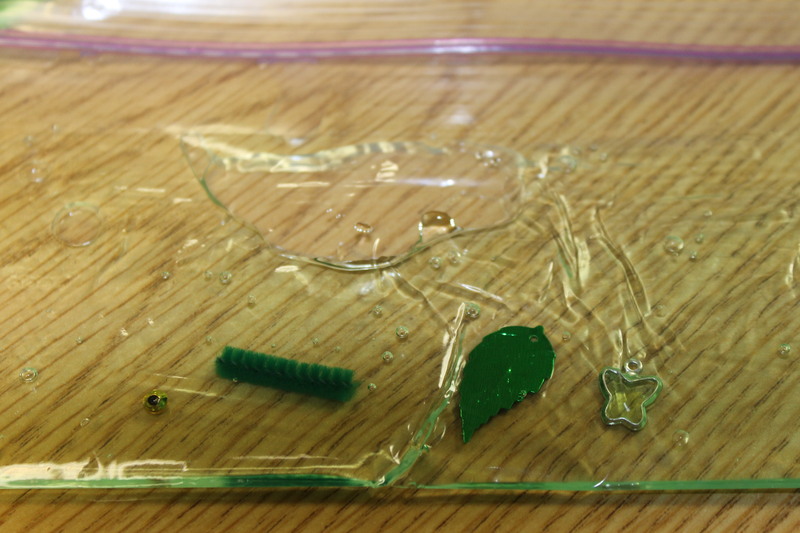 The kiddos make one and then take them home to tell their families the life cycle of a Monarch. 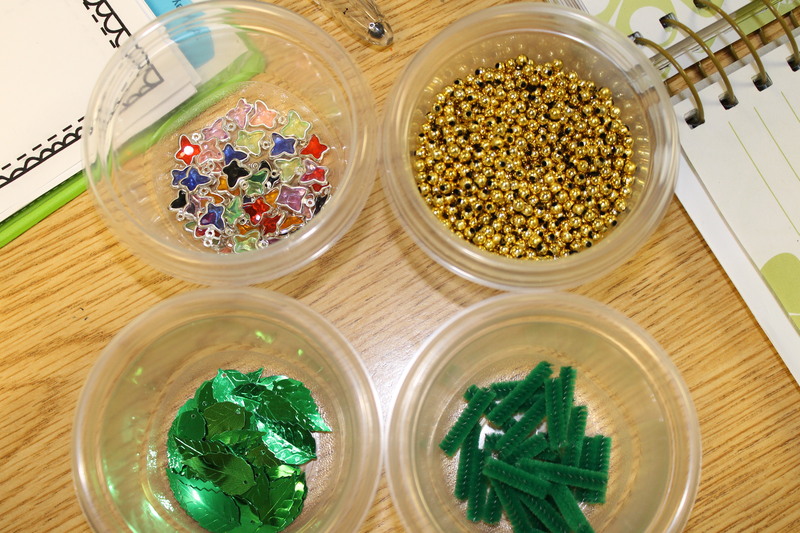 I set up the containers of beads this way and the sticky flags tell the kids how many of each color they need. 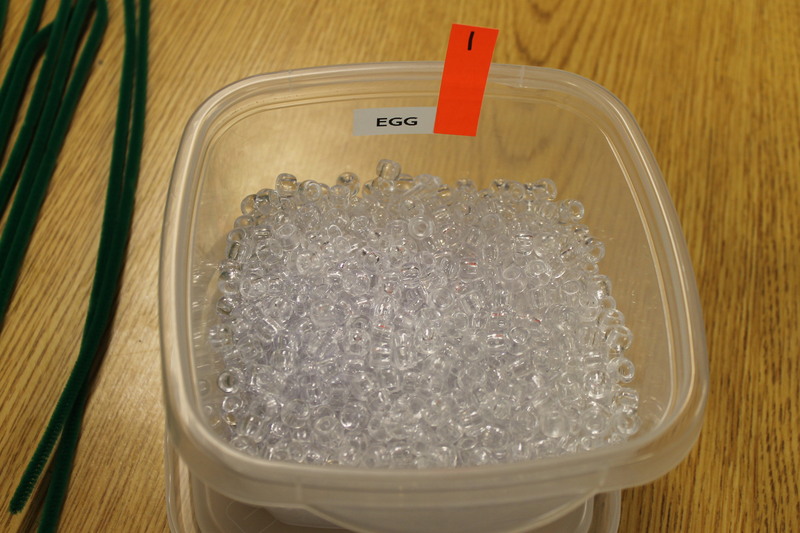 They grab their pipe cleaner and string their beads on as they move through the tubs. 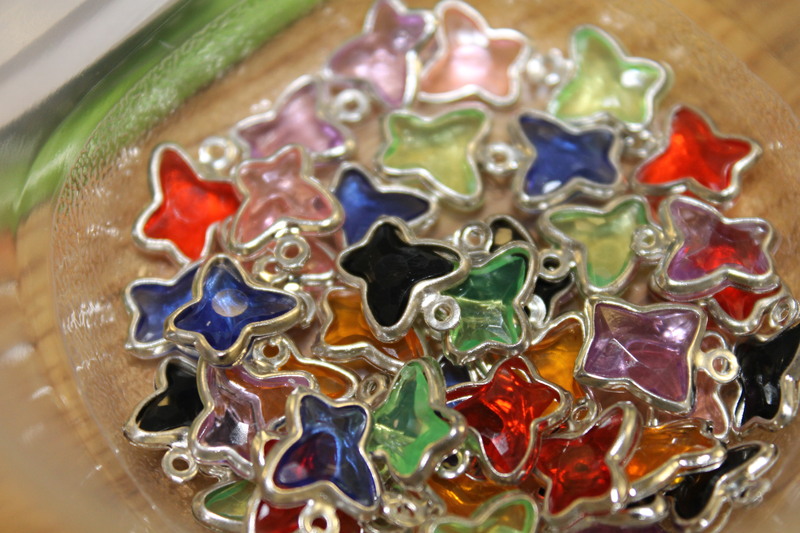 We then make our own symbolic Monarch Butterflies that will travel with the real migrating Monarchs down to the schools in Mexico. 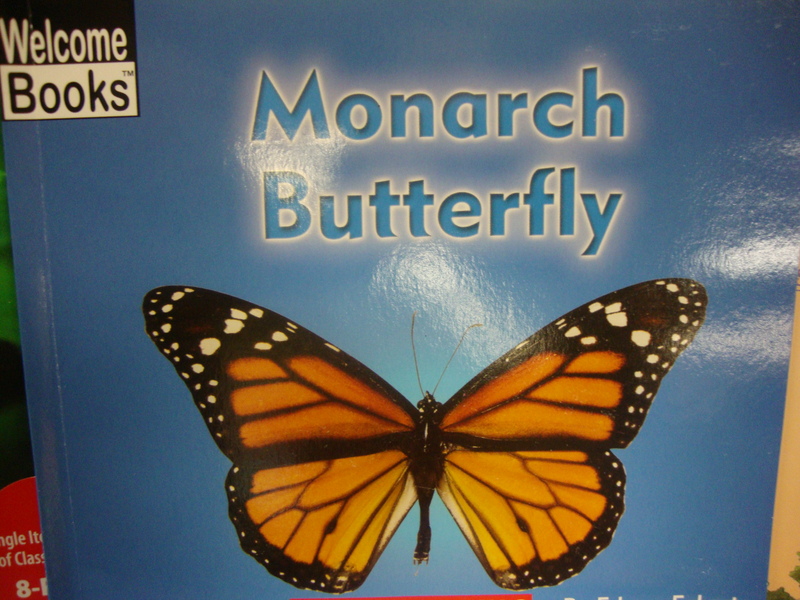 Our Monarchs will over winter in the schools in Mexico while the real Monarchs over winter in the pine trees in the mountains of Mexico. We also participate in Monarch tracking. 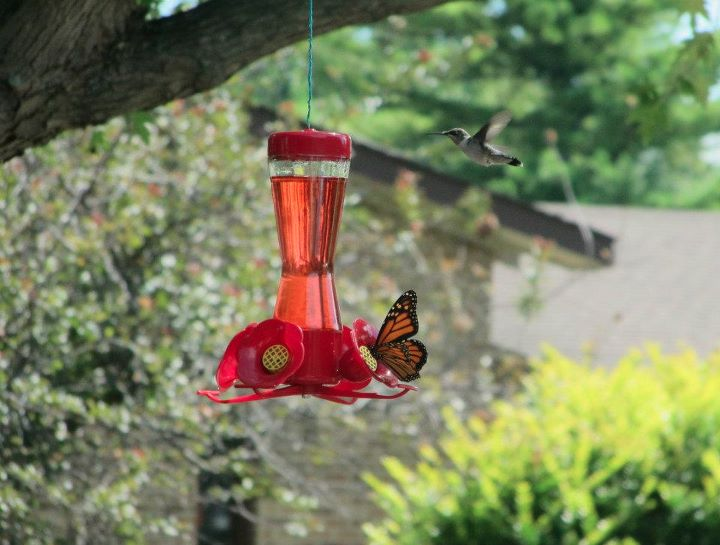 We go outside for set periods of time (10-15 minutes) and watch for Monarch Butterflies to fly by. 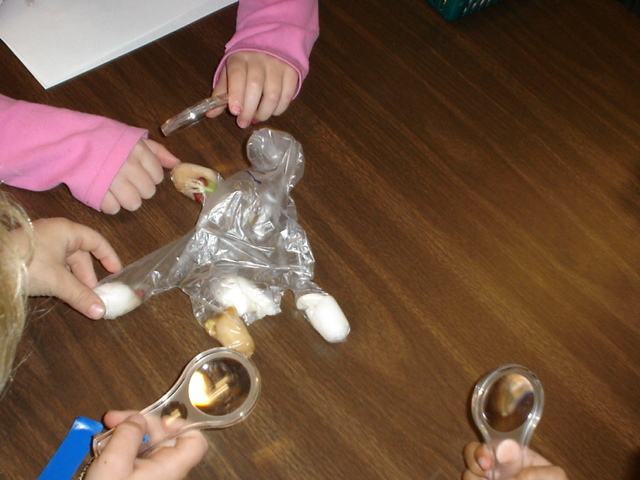 We count how many we see and then we record our observations on Journey North’s website. 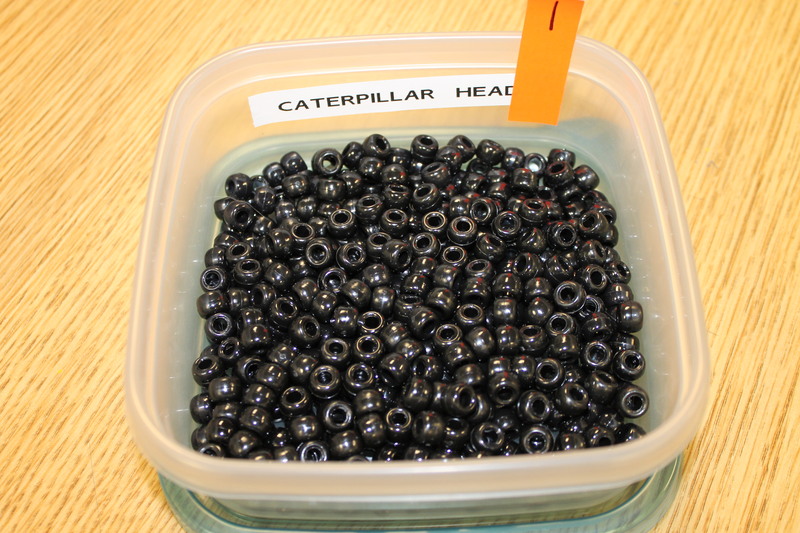 They track the migration of the Monarch butterflies to Mexico and you can help them track! There are also other animals that can be tracked to show signs of Spring returning or other migrations that you can track to show where animals go in the winter. 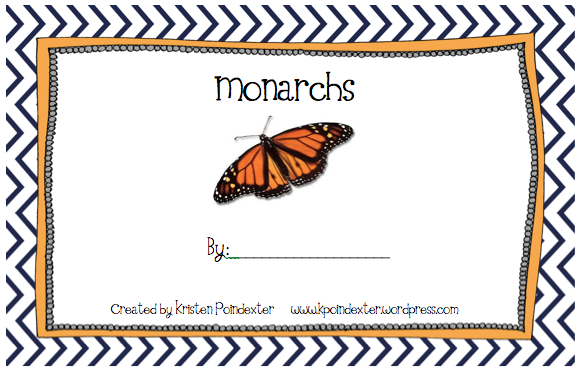 I’ll post pictures of our symbolic Monarchs soon. Thanks for coming! 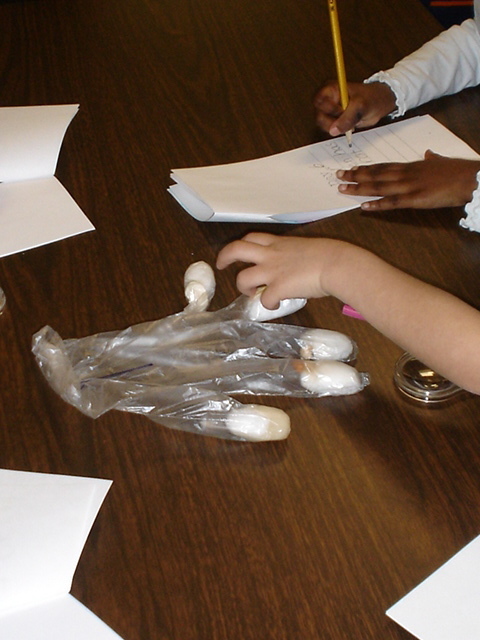 I hope you got lots of inexpensive science ideas to use in your early childhood classrooms! 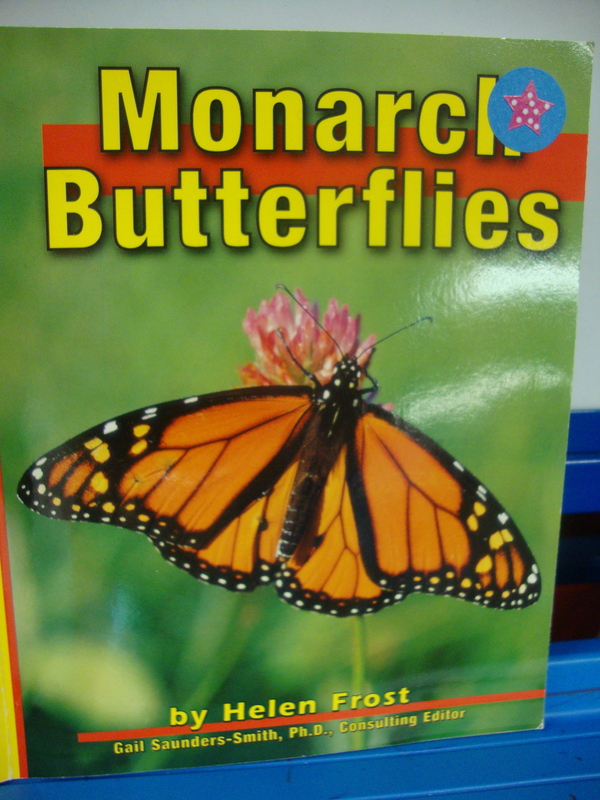 Last week, we did lots of activities to help us learn about the Monarch Butterfly. 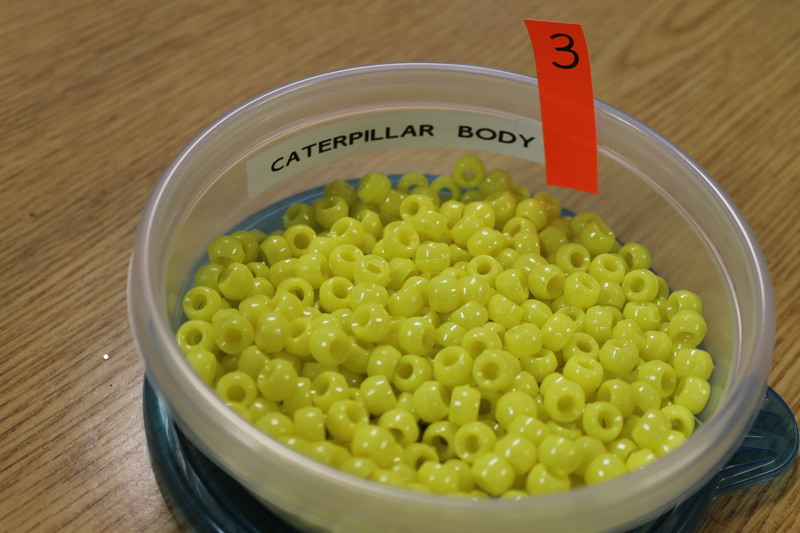 First the gold bead is the egg, then the pipe cleaner is the caterpillar. 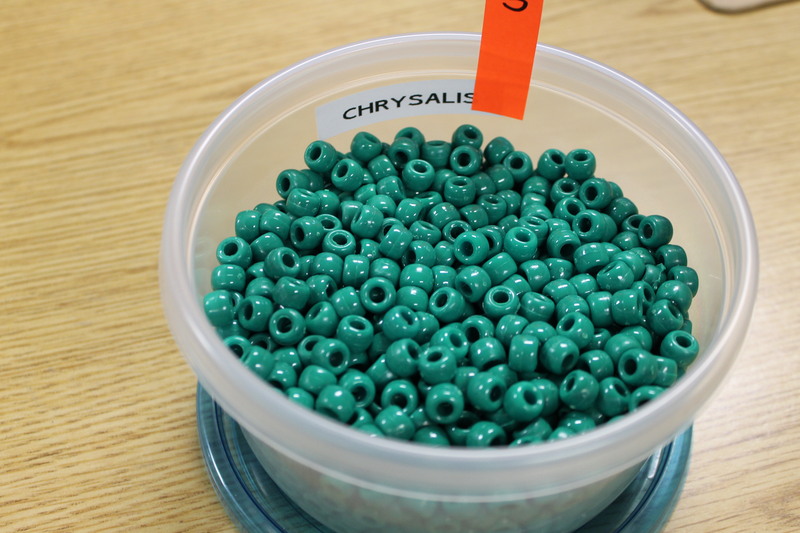 The leaf shape represents the chrysalis and the butterfly bead is of course the Monarch! 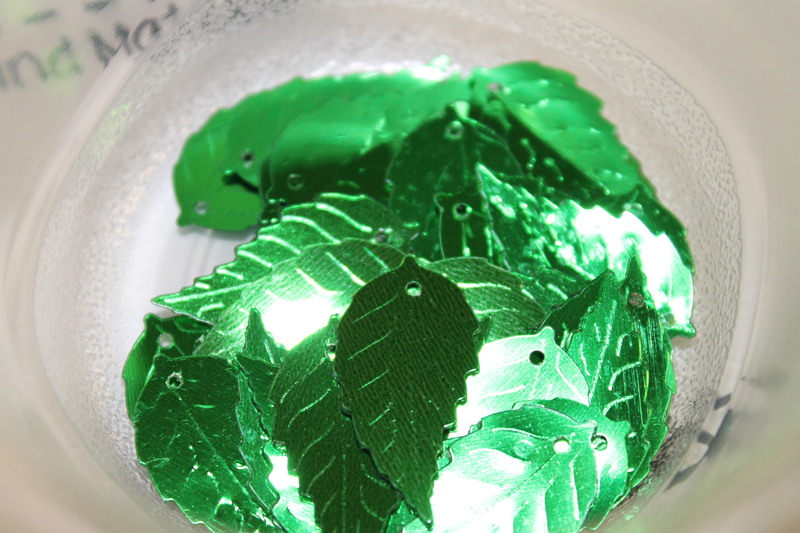 I got all the beads/leaves at Jo-Anns a few years ago and purchased enough to get me through! 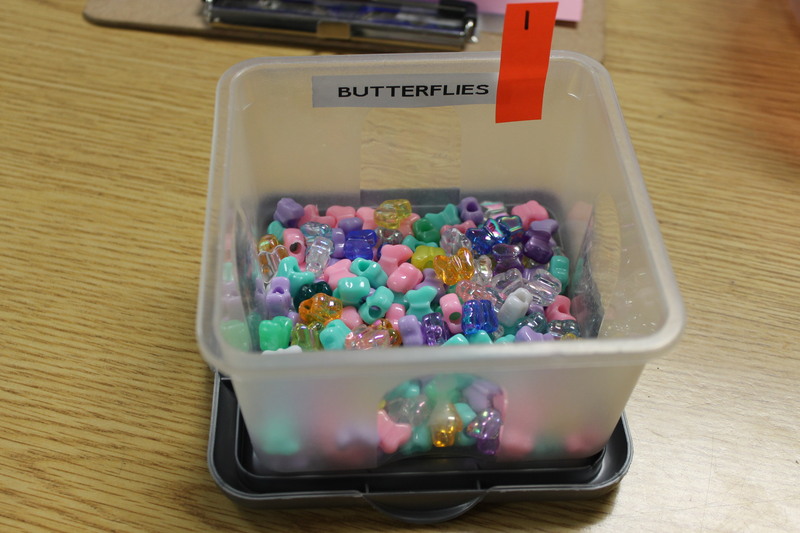 I put them in out in the smallest Ziploc containers and the kids just picked out the number of each thing they needed. They put them in the bag and then came to see me. I squirted in a good amount of hair gel (got it at the Dollar Tree–3 bottles have lasted me 2 years now!) 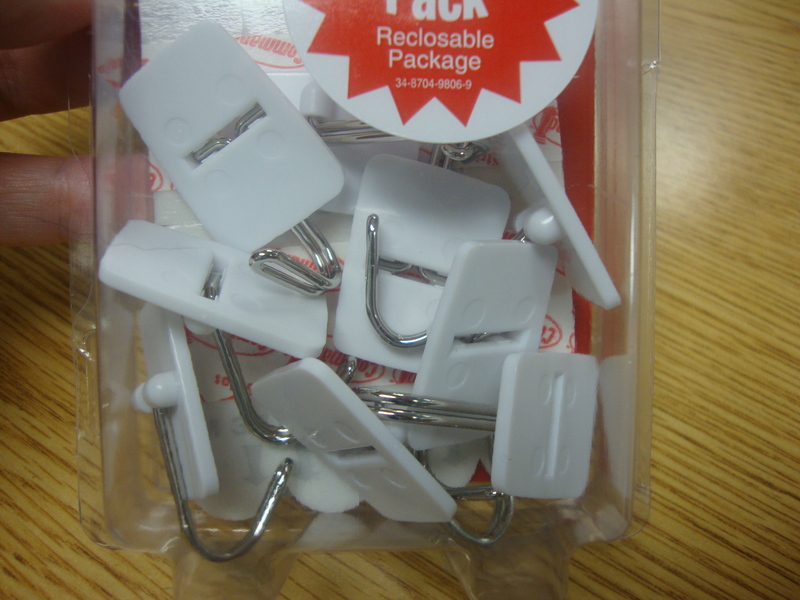 in their bag, sealed it up, and taped it shut. I found this on the Journey North website! P.S. If you haven’t checked out the website Journey North, you need to! 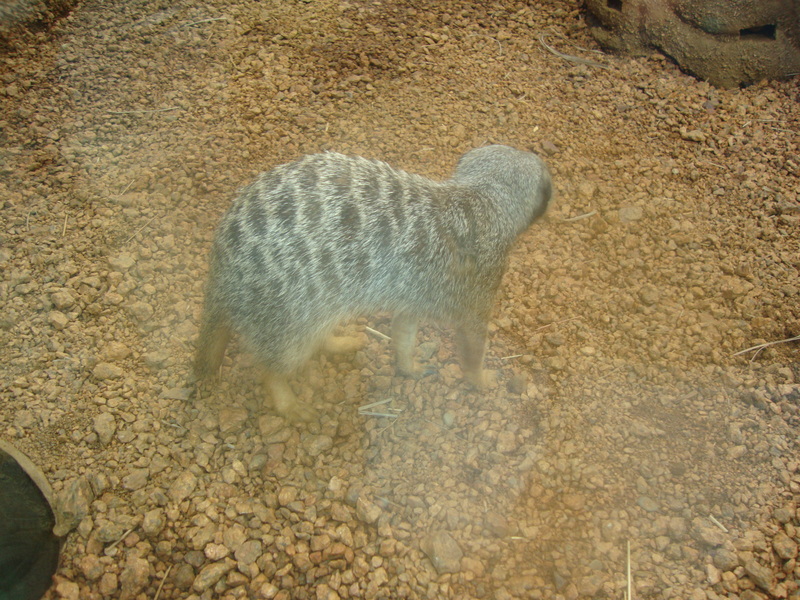 You can study the migration/hibernation of all kinds of plants and animals with your students. It’s free and has everything you need! 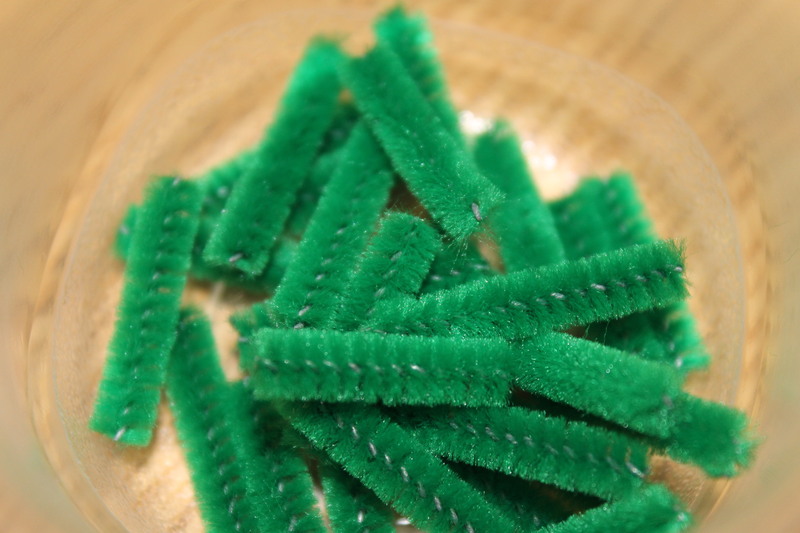 Meal worms are really easy to keep and you get to watch the life cycle happen over and over again. I just put corn meal in the bottom and some apple slices and carrots. 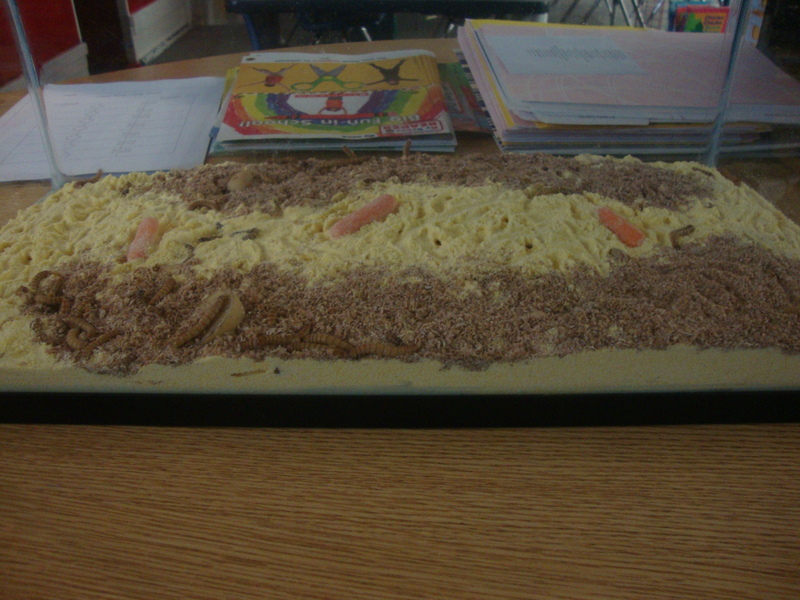 You also will need to add some water in a dish that the meal worms cannot get in to keep the humidity up. 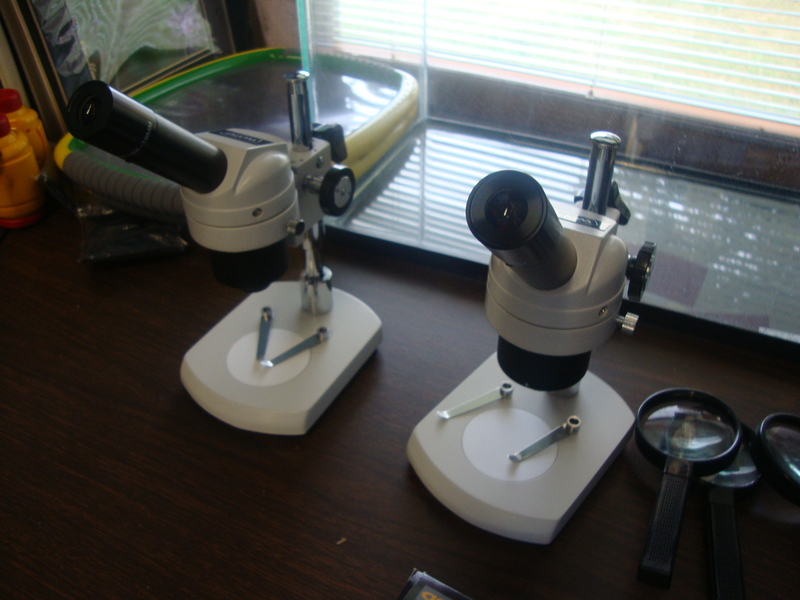 I got the 2 tanks, lids, a gram scale (for weighing the meal worms), 2 microscopes, and a hand held microscope from a Donors Choose grant in May. 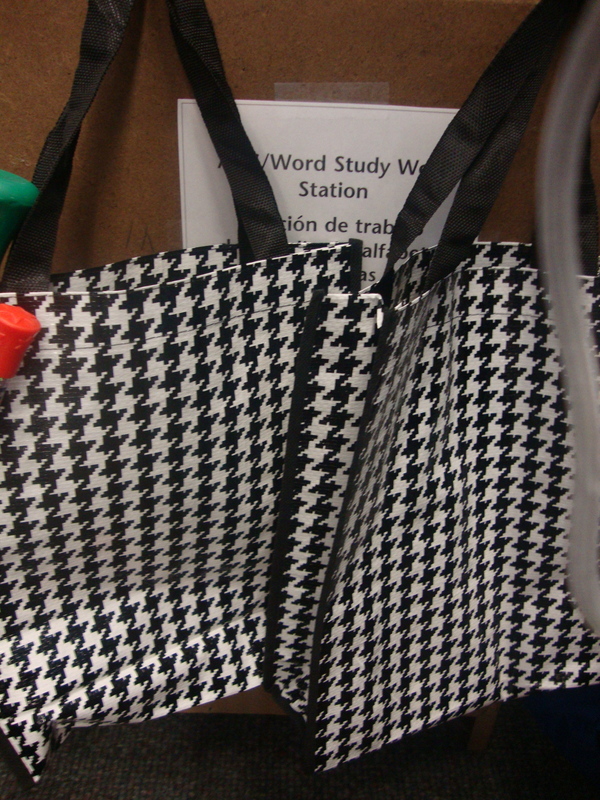 Here are some new pictures of my Literacy Work Stations. 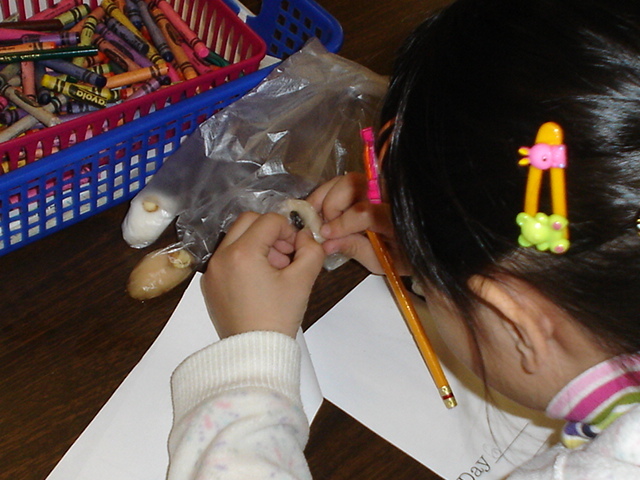 This is the ABC/Word Work Station. 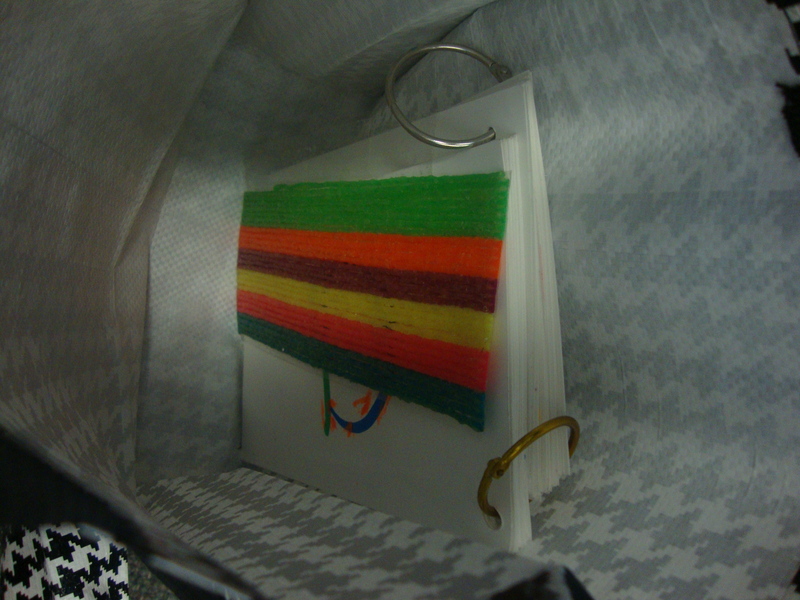 Right now, we have letter cards on a ring in the bag with Wikki Stix. 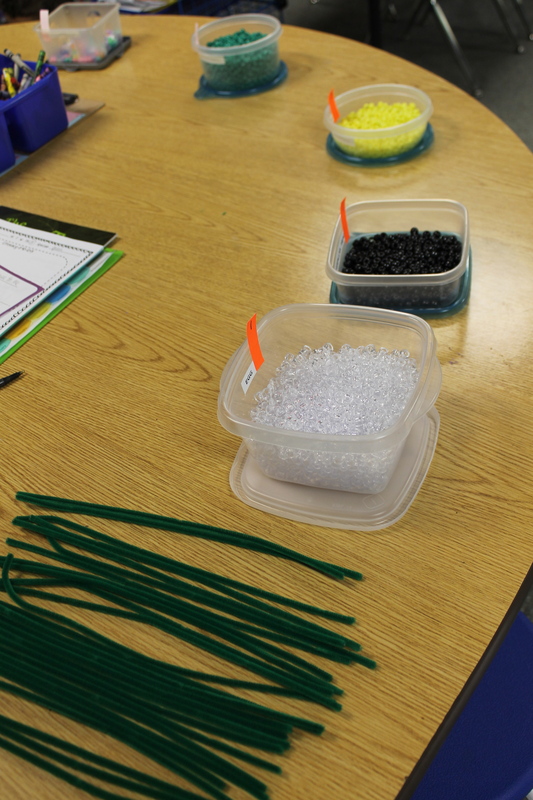 The children make the letters with the Wikki Stix. 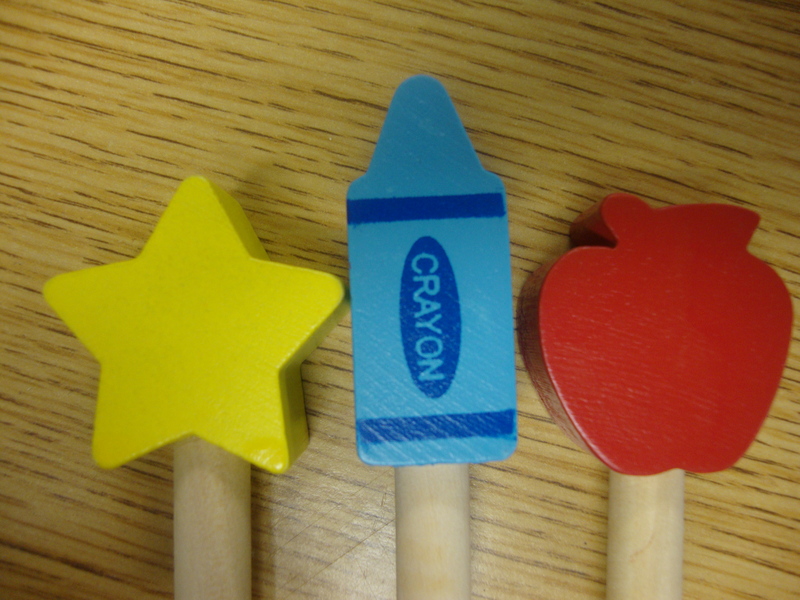 The children also have the opportunity to put Wikki Stix on each others names at the ABC/Word Work Station. 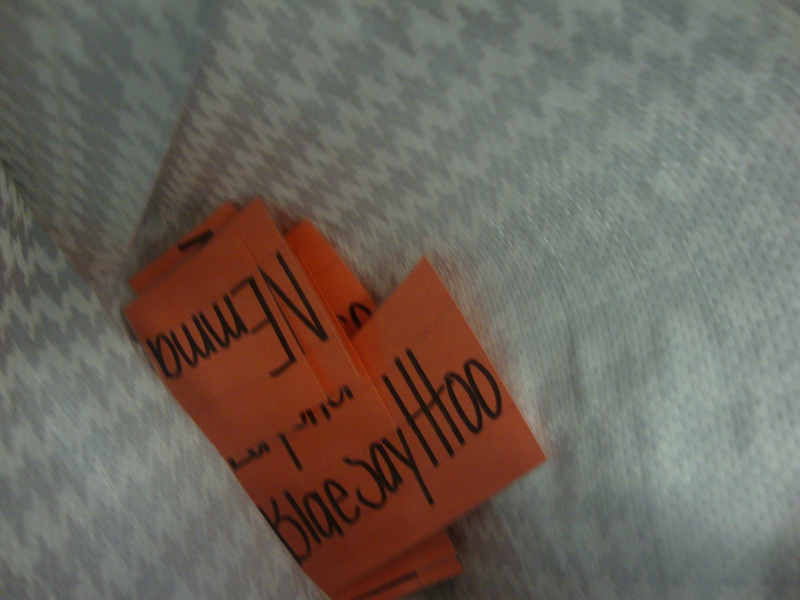 These are laminated. 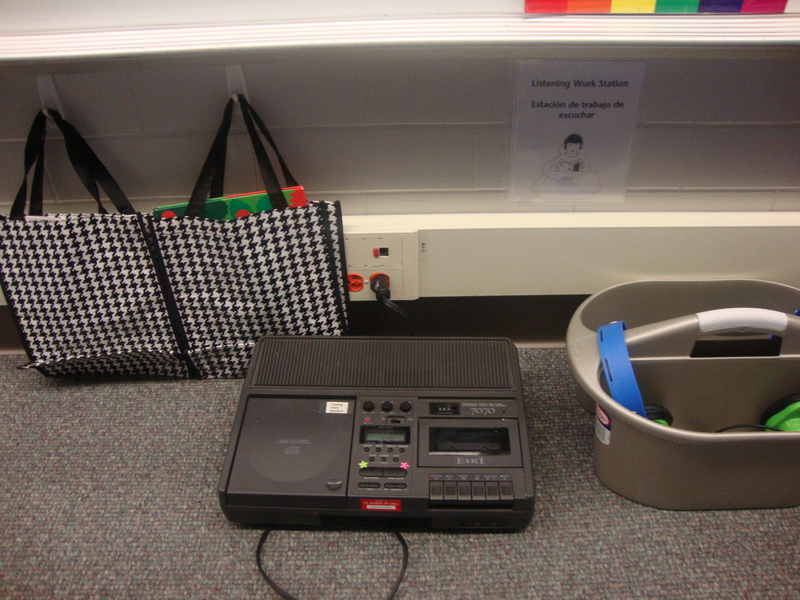 Here is our Listening Station. 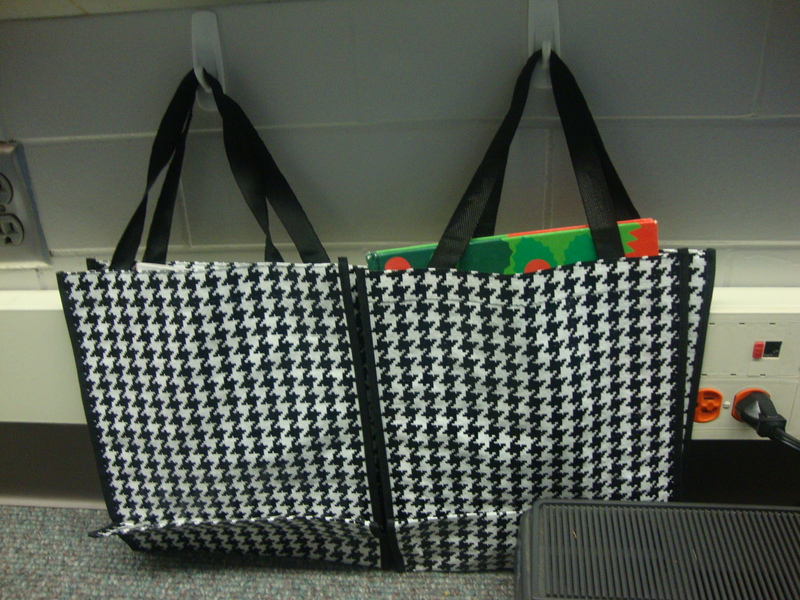 The black and white bags hold the books and CD. The headphones are stored in a cleaning tote. I am using the head headphones from my non-working leap pads. I also have several books and their CD’s available on the ledge just above the books. 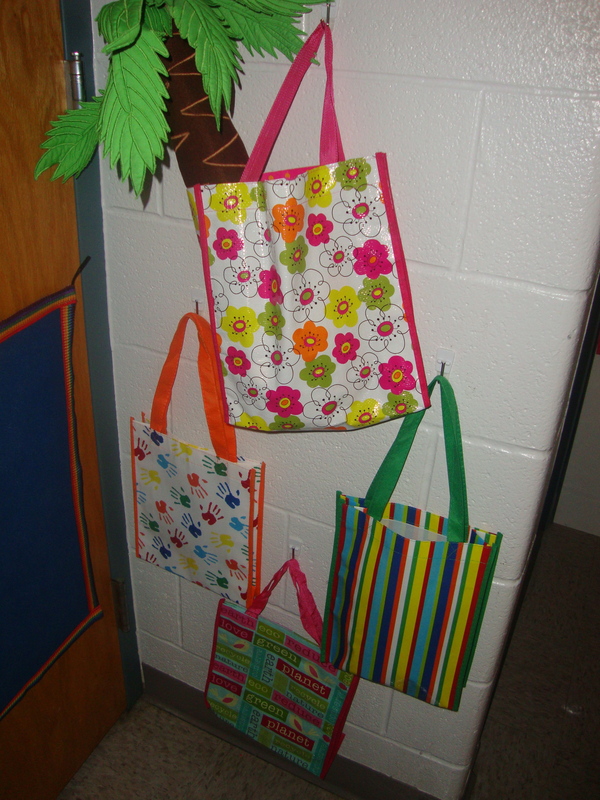 I try to put the newest titles on the ledge and the older ones in the bags. 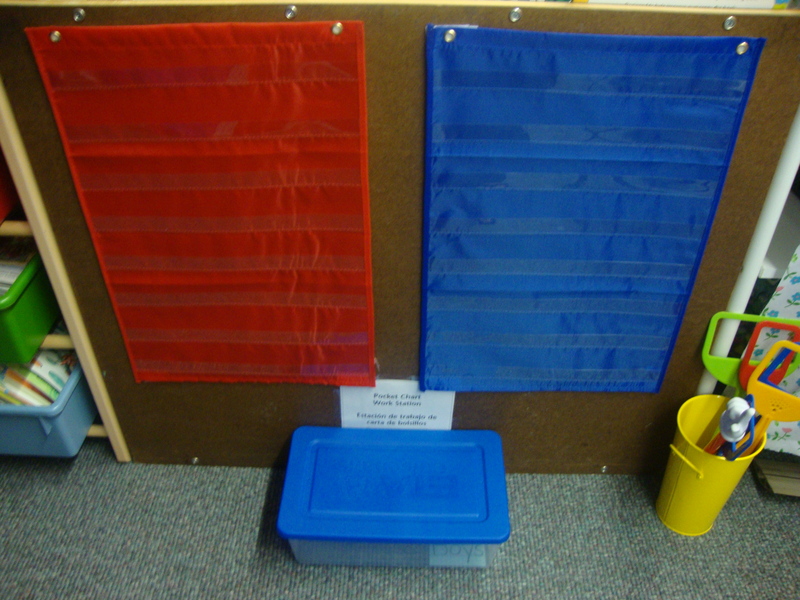 The is our Pocket Chart Station. Last year, I used a full size chart, but this year, I decided to make it more kid-sized and used these pocket charts from the Dollar Spot at Target. I took all of my kids pictures and glued them on sentence strips next to their names and then laminated them. 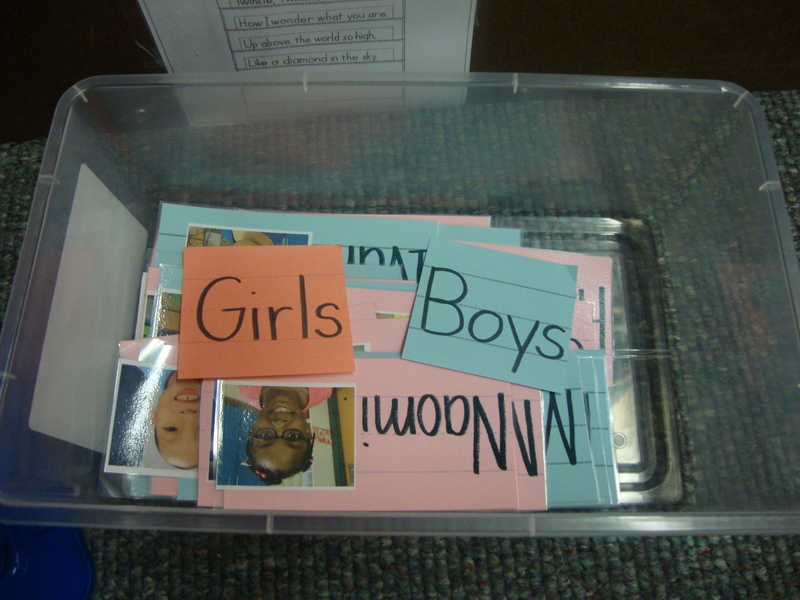 The children sort the names by “Boy/Girl” or Alphabetical order. I’ve also added a poem about Pets (you can find it in the Interactive Charts Book that goes along with Building Blocks). This is my Drama Work Station with the Chicka Chicka Tree in the top bag. 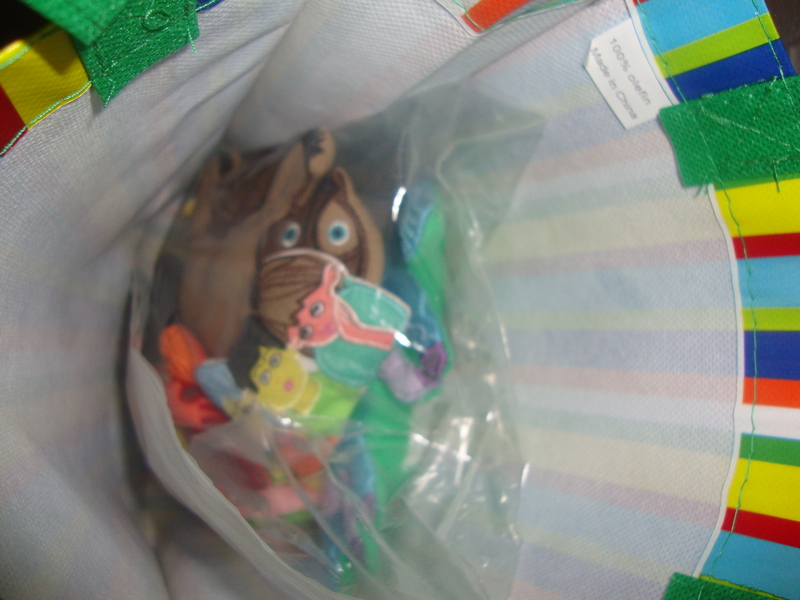 Two other bags also now hold the drama props for Brown Bear, Brown Bear and Mouse Paint (I got them all through a Donors Choose grant). 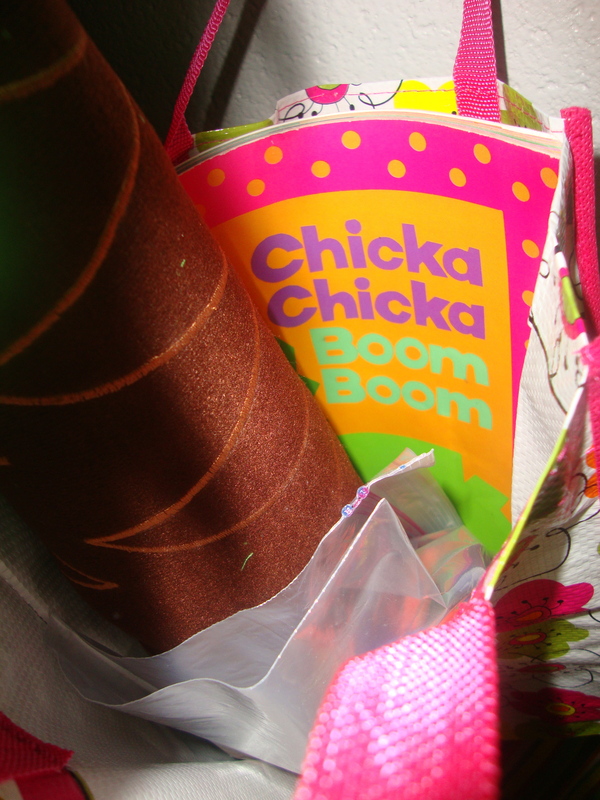 A look inside the Chicka Chicka Bag. There is the large tree, the velcro letters, and an copy of the book. 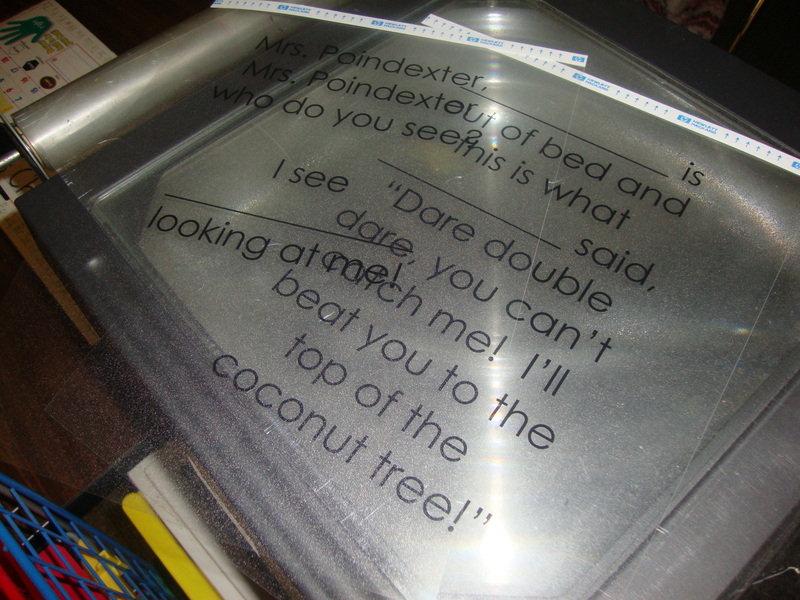 These are the overhead transparencies I made to go along with Brown Bear and Chicka Chicka. 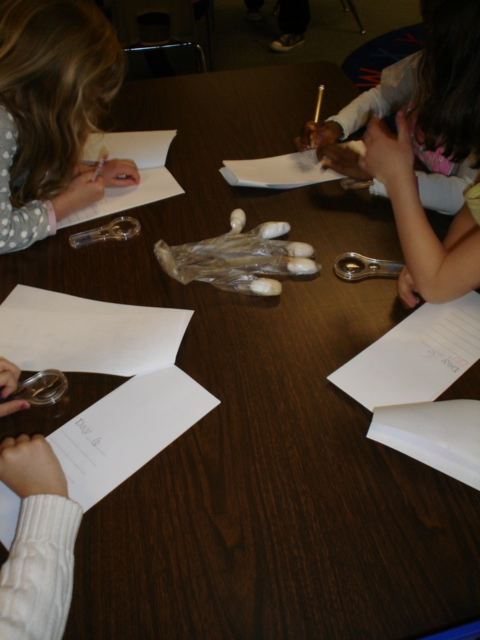 The children use the pictures of them I printed on transparency sheets (see two posts ago) and put them in the blanks. They then read the words and then put a new child’s picture in. I also made some to go along with Cookie’s Week and I’ll post those soon. 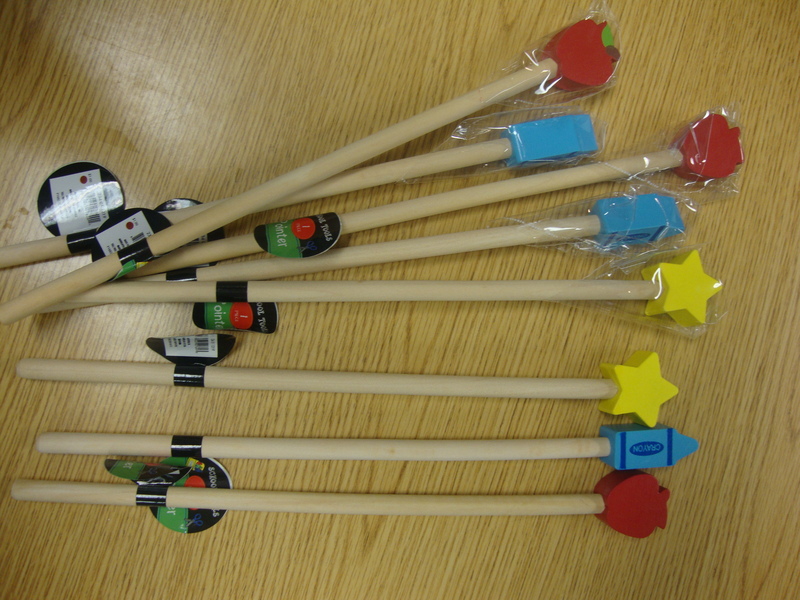 I found these cute pointers in the Dollar Spot at Target and we use them for pointing to words in Big Books and for reading the names and words at Pocket Chart Station. I got these puzzles at Wal-Mart for $3.00 each. 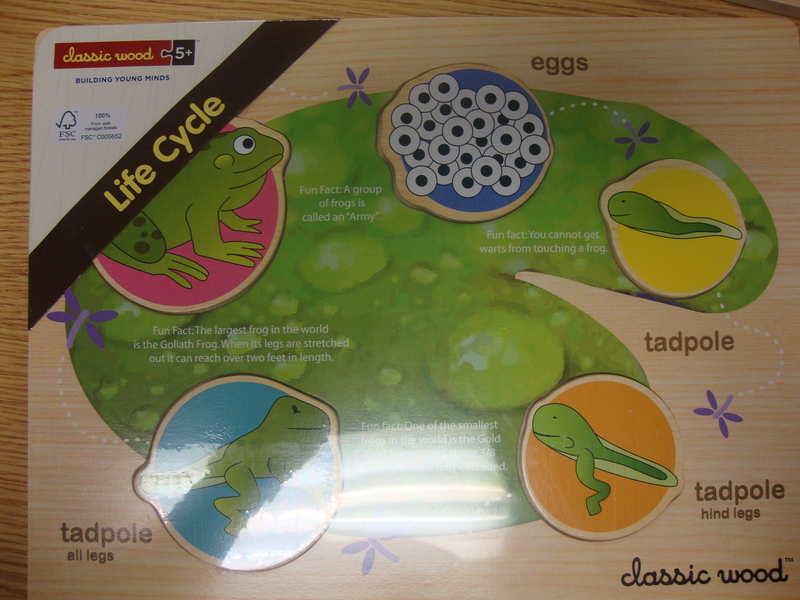 They show the life cycle of a frog and a butterfly. 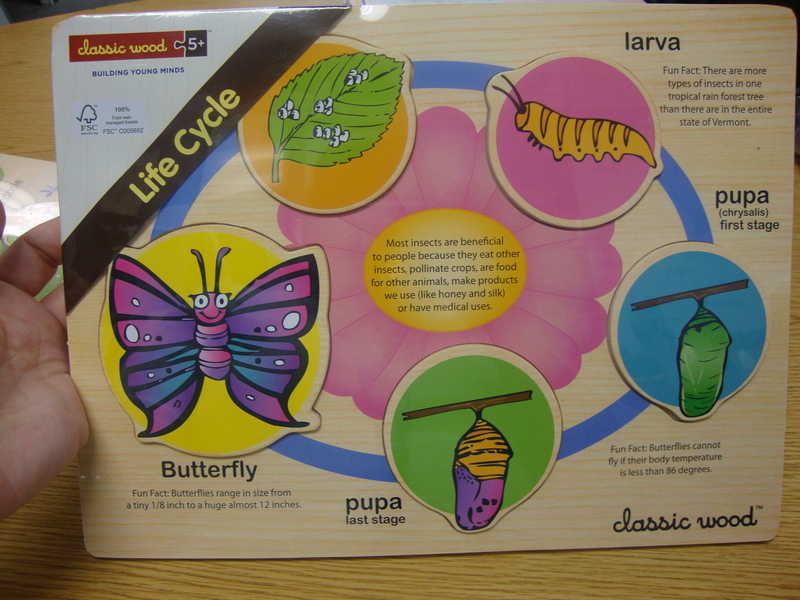 We’ll be using the butterfly puzzle next week, when we learn about Monarchs. I’ll have it in my Science Work Station. I also found these cute signs in the Target Dollar Spot. 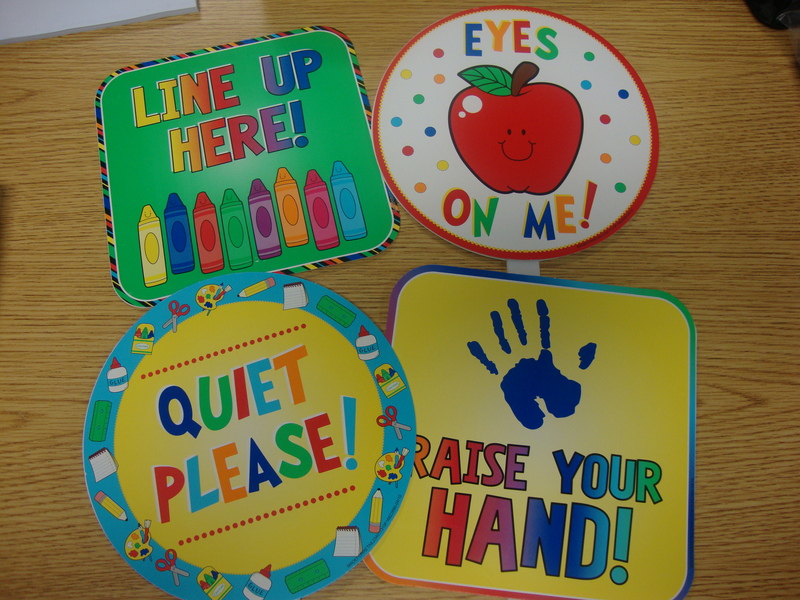 They are great for using signals rather than trying to talk over all the children! 🙂 I use them as reminders when we are sitting on the floor. They work really well! 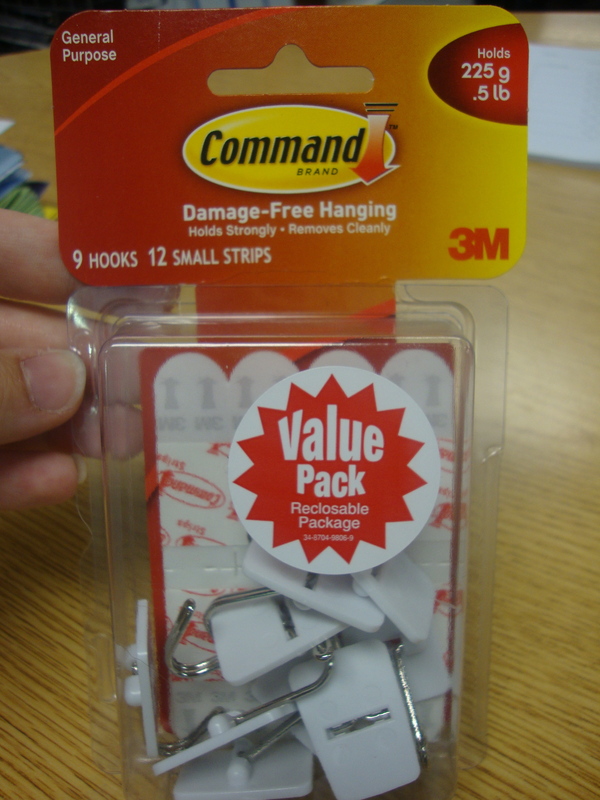 I had a few questions about the kind of hooks I use to hang all the bags up around my room in my Work Stations. 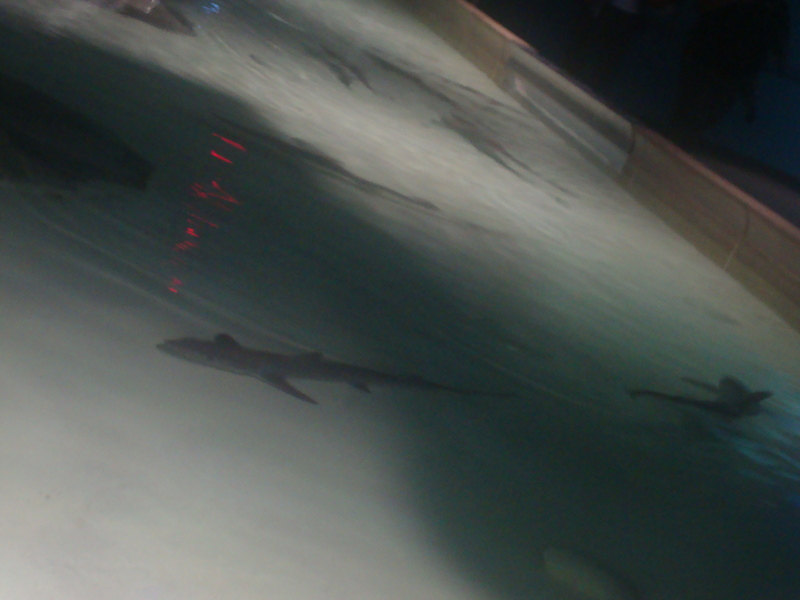 Here is a picture of them. 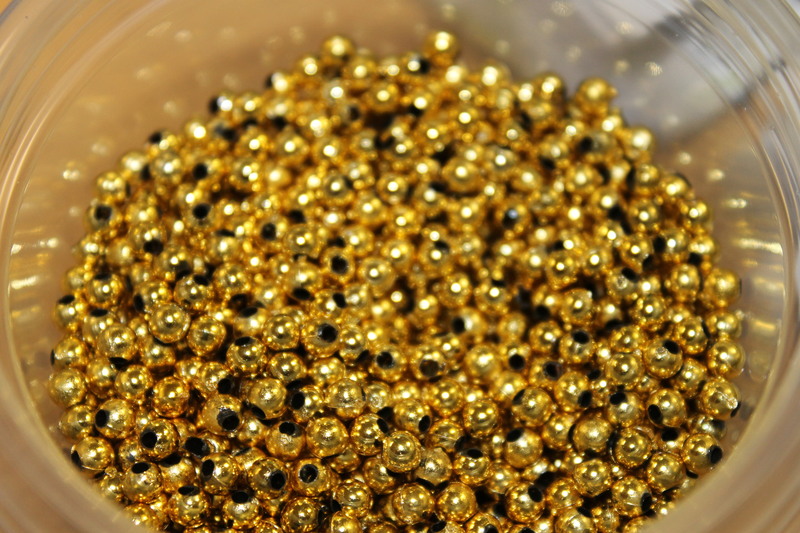 Here’s a close up of them. I don’t have much in the way of new things to share with you, I’ve been working on making some new cards in my free vacation time and you can check them out here. 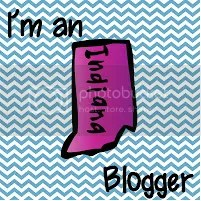 If you’re interested in purchasing any of them or becoming a Stampin Up! demonstrator and earn some easy extra money…shoot me an e-mail and let me know, or if you would like to purchase some of your own materials or a kit with pre-cut materials, contact me at fuzzlady77@hotmail.com!! 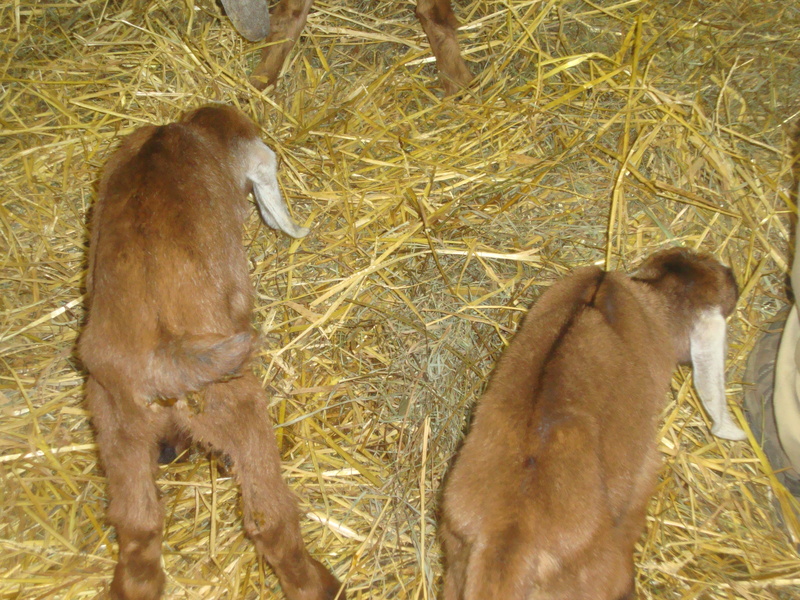 Today we took a trip to the zoo and saw the most adorable baby goats…they were born yesterday (March 29th). Two mommies gave birth and they each had 1 girl and 2 boys, so triplets for both! 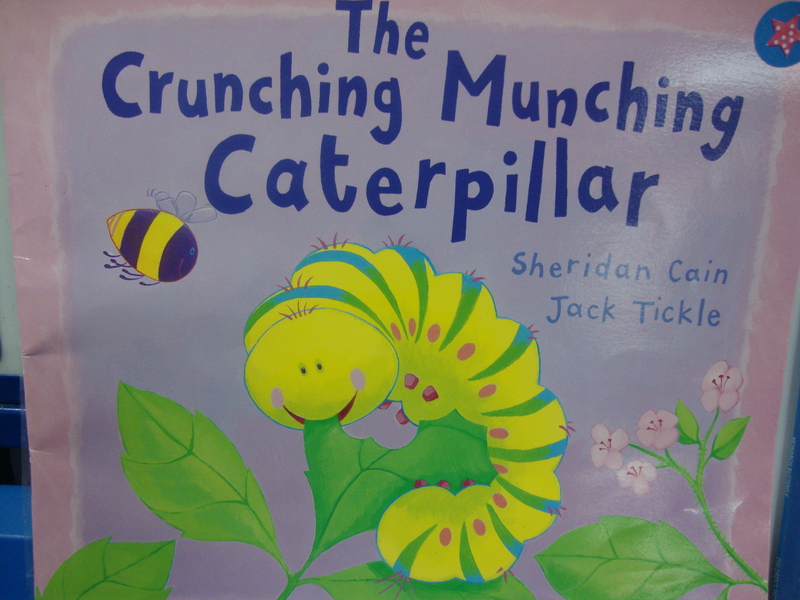 We began our study of insects/bugs by reading The Grouchy Ladybug by Eric Carle. 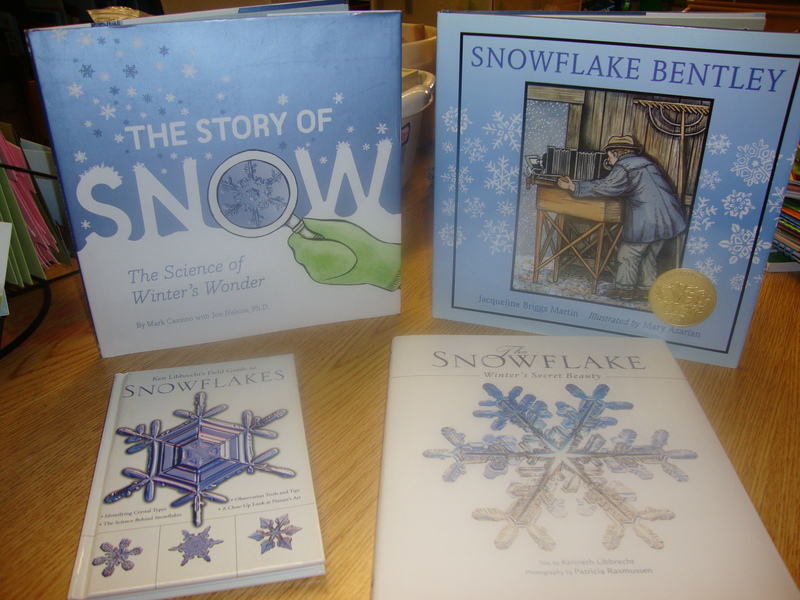 After taking a picture walk and reading it aloud to the children, we discussed the clocks that are pictured on most of the pages. The children learned that we would be learning about telling time and addition (with ladybug spots) this week during math. I have several sheets that I will post in the next few days that deal with telling time and ladybug addition…so stay tuned! You can download pictures to sequence by going to my PDF page and searching for them–they will only download on certain computers (not sure why!! ), and so far there is nothing I can do about it! Sorry! You can search on Google for images and print those out. 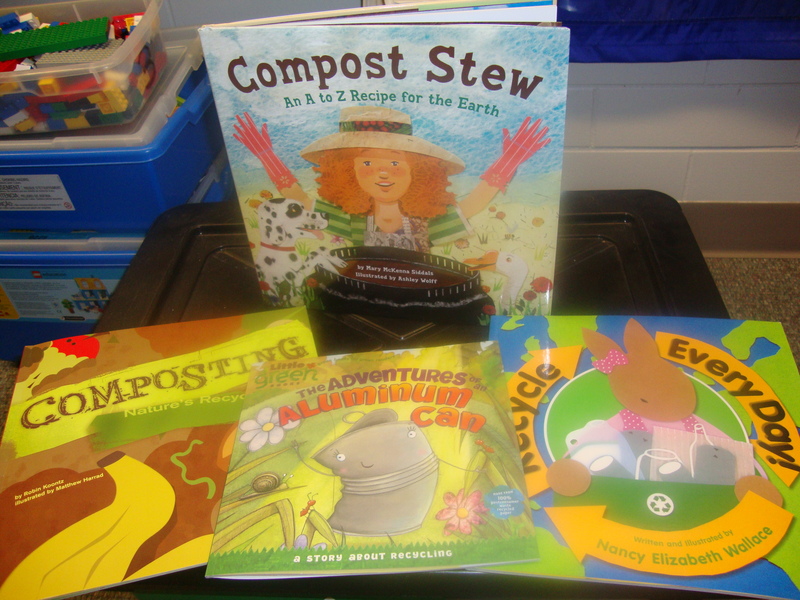 We also checked in on our beans that we planted last week and noted our observations in our Bean Journals: beanjournal (you can switch these so that the journals take up 1/2 of a page side to side instead of top to bottom like they are here). 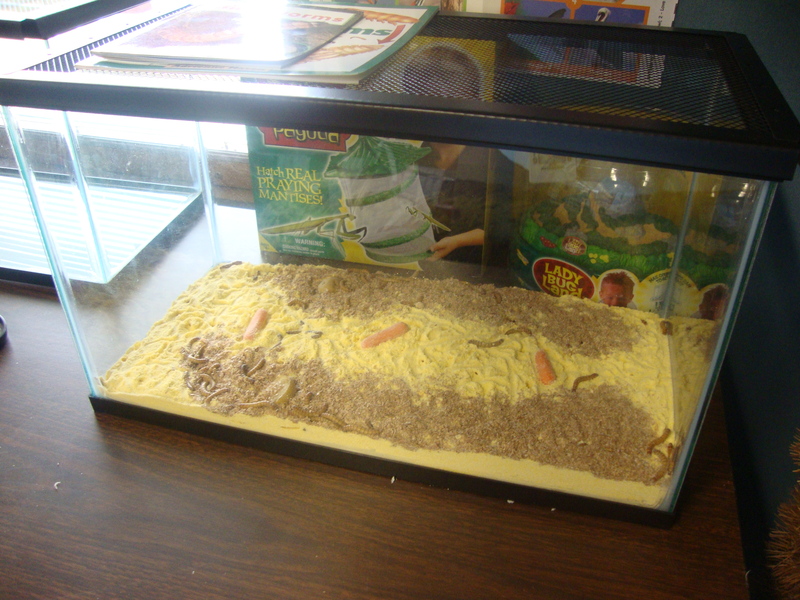 Our Painted Lady Butterflies (caterpillars really) have arrived and are eating lots and lots! They have doubled in size since arriving last Thursday, so we will soon transfer them to our netting we have set up for them. 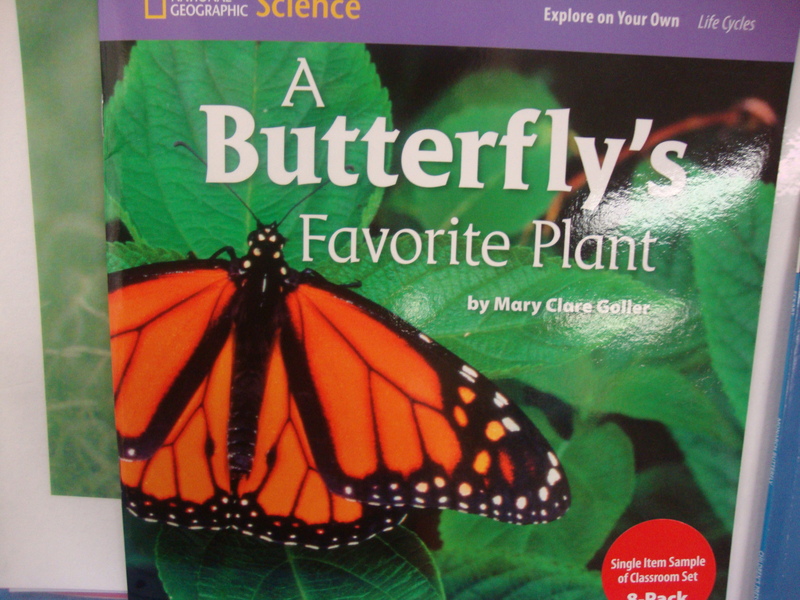 We also looked at our Scholastic News: “How Do You Know It’s An Insect?”.